Summer movies. The multiplex filled with big blockbusters and superhero movies. Seems like even the most obscure comic book heroes are having their origin stories turned into mega sequel making summer fodder. Not so for poor Robin though. Always relegated to a mere sidekick, he longs for the fame and fortune that his own movie would afford him. This is the premise for the Teen Titans movie and supported by his superhero team of Cyborg, Beast Boy, Starfire and Raven; Robin will go to any length to make this dream a reality. In search of an adversary that might make them get taken a bit more seriously in the superhero community, the Teen Titans cross paths with Slade, a supervillain with more than a passing resemblance to Deadpool. Teen Titans Go! To the Movies is based on the popular series on Cartoon Network about these five misfit teenage superheroes. Its comedy has enough wink-wink humour to entertain both young audience and parents alike. It cleverly parodies superhero movies, and DC movies in particular. And even Stan Lee makes his inevitable superhero movie cameo- notwithstanding that it’s not a Marvel movie. While the movie contains enough fart jokes to delight any younger audience member, parents with any comic book/movie knowledge will enjoy the lampooning of Batman v Superman, the tribute to Back to the Future and a reference to Gene Hackman’s Lex Luthor that some younger parents might not even get! 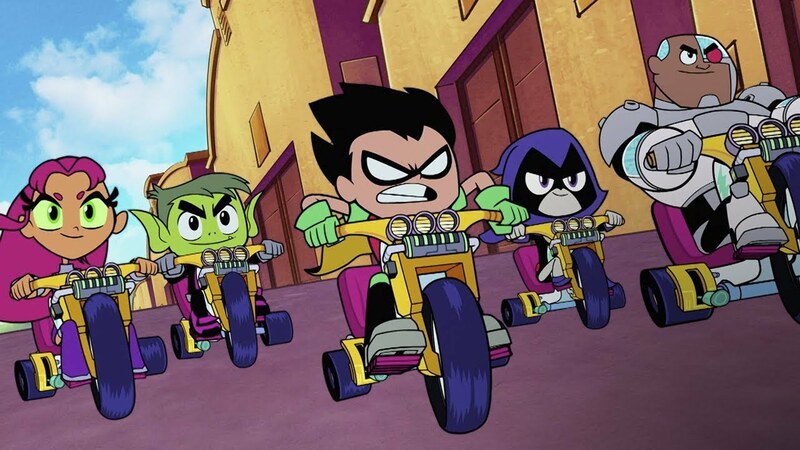 Teen Titans is a firm favourite in my household and watched on a near daily basis, so I knew that it would be a hit with the 5 and 7 year old, who declared it “so good” and “even better than any movie I ever saw”. High praise indeed. Teen Titans Go! have some impressive voice actors in their cast with Will Arnett adding to his long list of animated characters voicing Slade. He is joined by other animation blockbuster alumni such as Kristen Bell, Patton Oswalt and Jimmy Kimmel. Even Nicholas Cage is in it. It’s also filled with catchy songs that might drive older audience members to distraction or send them into a frenzy of reminiscence with classic 80’s fare like Take On Me and Back in Time making it onto the soundtrack. Teen Titans Go! To the Movies is a adventure comedy which cleverly pokes fun at superhero movie while also carrying an important lesson of the value of friendship and loyalty. Its message is that fame is ephemeral and nowhere near as important as friendship, teamwork and being a decent person. Teen Titans Go! To the Movies is on general release from August 3rd and is bound to entertain any junior members of the family over the summer holidays.